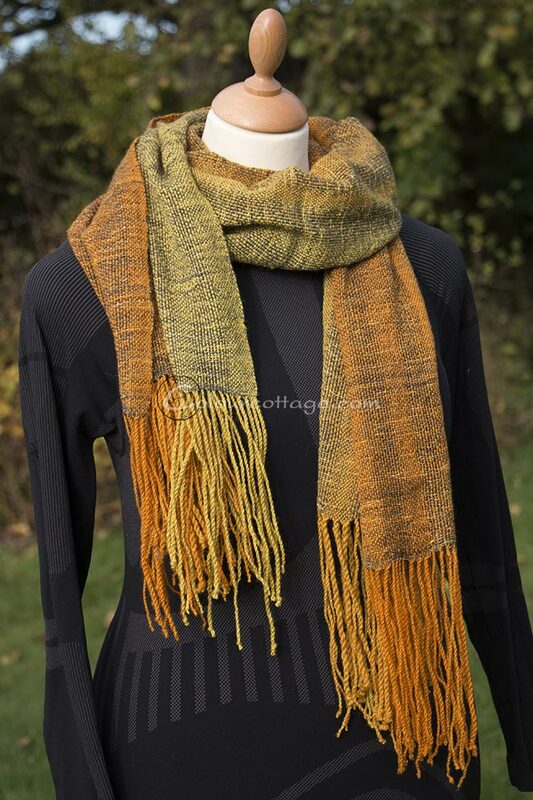 The only weaving I’ve done since July have been a couple of samples/studies/what ifs. 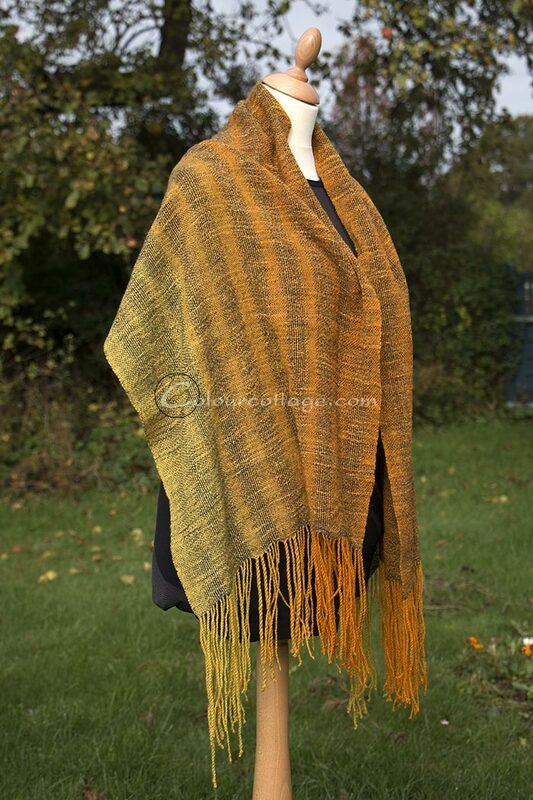 First I’ll show you a shawl or short scarf that I made from a skein of handspun which I never really could come to terms with. Yellow isn’t my favourite colour in garments, so I’ve been giving this the hairy eyeball for years. It’s a challenge in itself to use small amounts of yarn that doesn’t match anything! 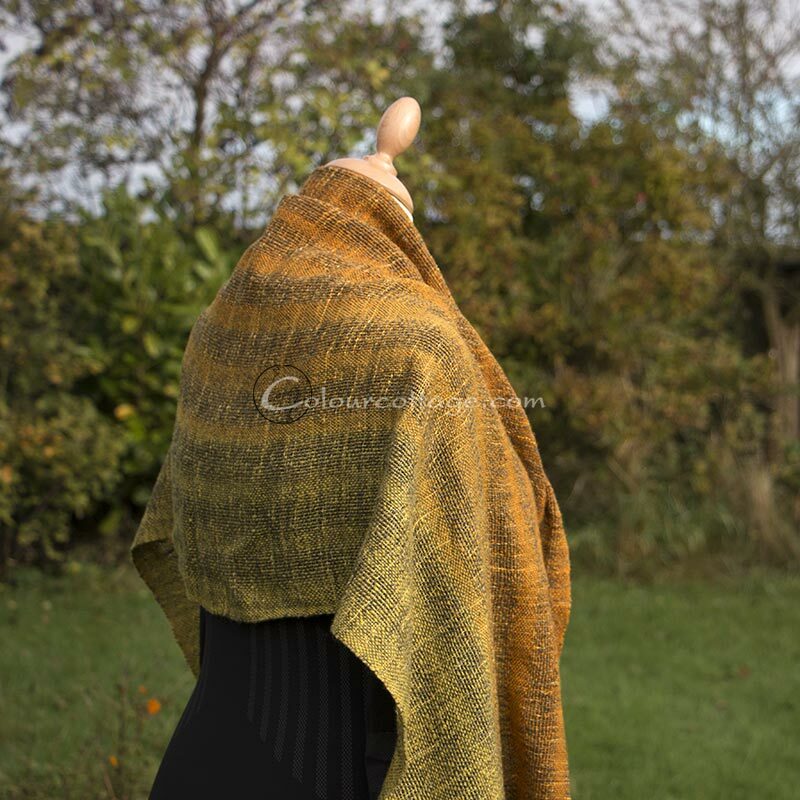 It was spun as one long gradient from orange to yellow, so in fact perfect for a colour change like this. To stretch it a bit I warped using the so called cram and space method, varying the density along the fabric. 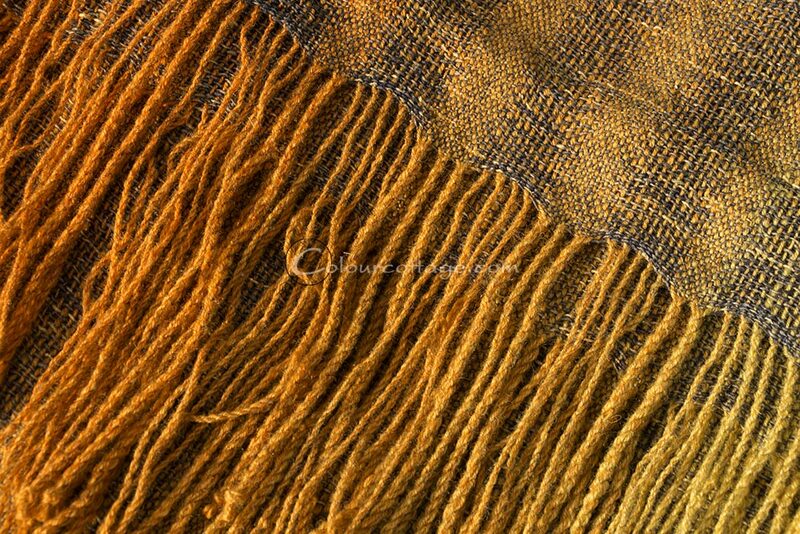 The weft is a silk noil single which I dyed for the occasion after trying out various colours. I did a thick n thin version of fringe twisting too and to keep it completely rustic I varied the lengths. Now I just have to find someone who’d like to wear it! same skein wound one way and the other! That is so completely gorgeous! Truly sincerely, I am in love with the colours and texture. I am sorry for your discomfort, I hope you find some relief soon. Thank you 🙂 Praise sometimes makes me embarrassed, but I do appreciate it! Flot sjal, selvom det heller ikke er mine farver. Den slags farveovergange er guf for øjet. Din balle: Kan du sidde som afrikanske kvinder? altså på gulvet, rank ryg og strakte ben? Ellers er det noget at øve sig på. Mit “bagben” og omegn er blevet meget bedre, siden jeg begyndte på at gøre sådan et stykke tid om dagen + lidt professionel massage. Vi sidder jo og krøller vore arme ben hele dagen, og mange – jeg selv inklusiv – har en dårlig vane med at sidde og stemme imod, når jeg bare sidder. Ja, det kan jeg godt, og tage fat om mine ankler når jeg står op. Men ja, jeg laver strækøvelser. Siddende opgaver hjælper faktisk, det er stå, gå og læne mig fremad som giver problemer. Fysioterapeutens styrketræning gør det også bare værre. Jeg har nok taget lidt for hårdt fat med det byggeprojekt i for lang tid. Sådan går det, når tante Kageform tror hun er tømrer. Hope you find a person to adorn that beauty soon…..it is very lovely. 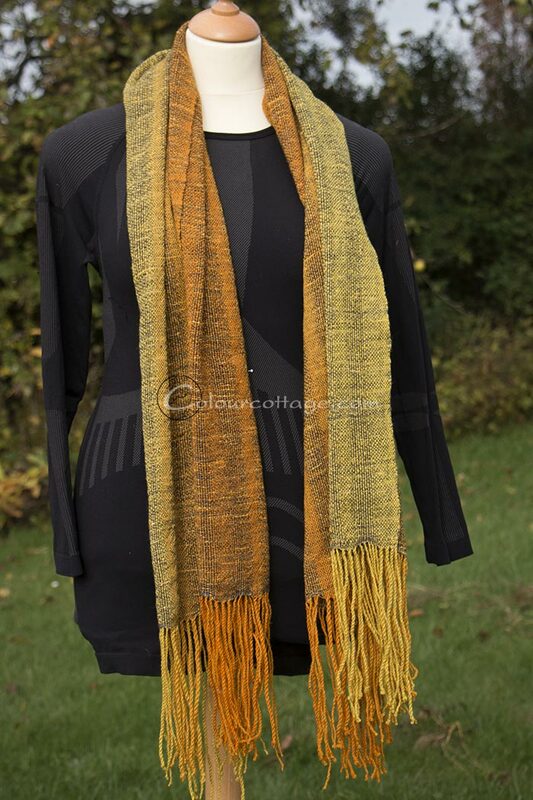 I am always struck by the colors I choose to spin….yes, oranges, yellows, reds……colors I don’t often wear myself, and then once spun and knit up into something I realize once again those colors are not for me. Then the task of of waiting for the right recipient. 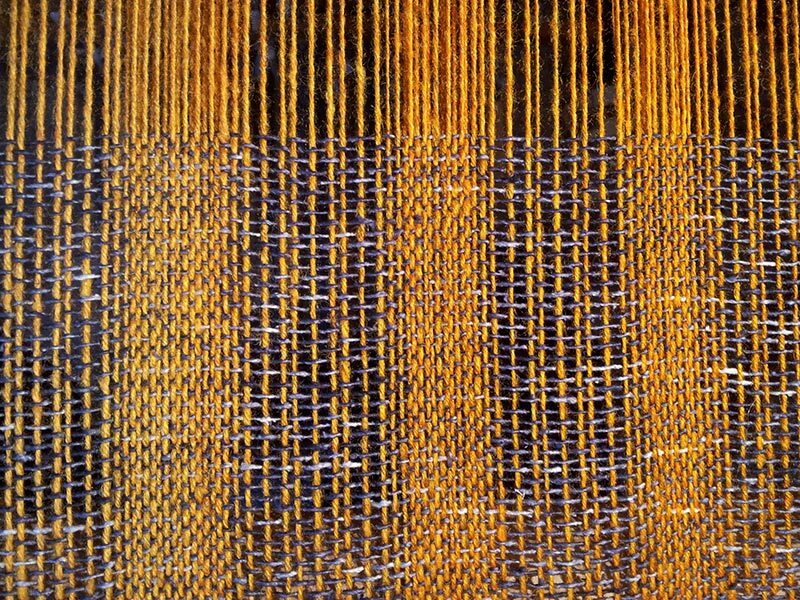 Hope you feel better soon and are able to get to all the weaving you have waiting. How is the studio coming? Still plugging along here…slow ( very) but sure! Slow progress here as well, but I’m done with the insulations at least. Strange how colours can seem so lovely as fiber or yarn, but knitted up they just become clown barf. 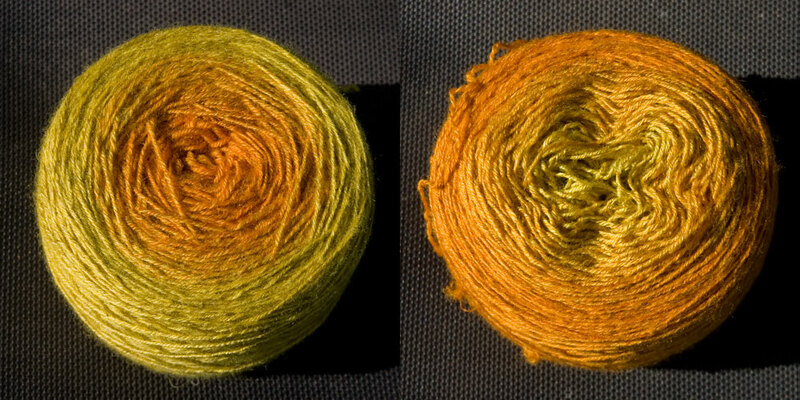 I was pleased that I found a solution for this yarn that seems to fit it – even if I’m not a yellow person. I’ll definitely work with this type of structure again. I love seeing what you’ve made! I like this cramming/spacing idea but I hadn’t seen anything woven that way–it’s cool! I hope you can get back to your looms soon. Me too! Projects are piling up. Which is ridiculous since I have a million things I can do which don’t hurt my back…. 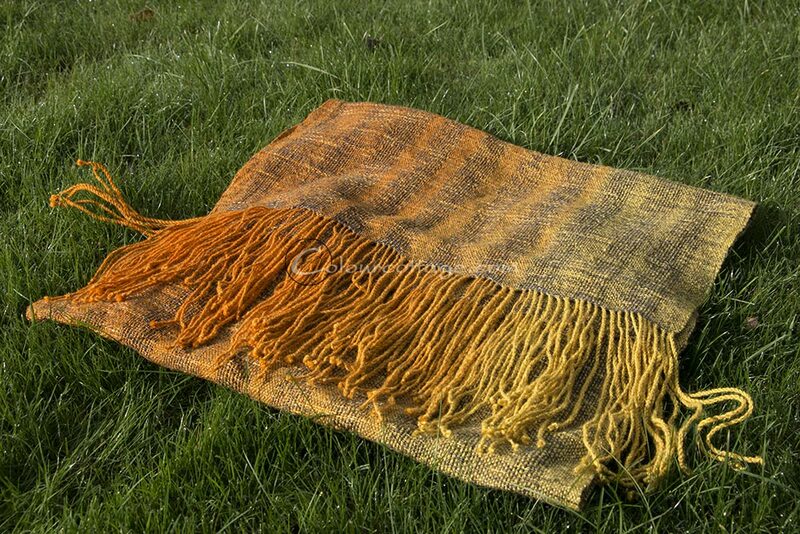 The shawl is beautiful, I love the pattern and the colors, although I am not a yellow person myself. I am sure someone will be very happy for it! Thanks, coming from a weaver that means a lot. Thank you, and I think you’re right, it will light up a rainy day. Very, very pretty. I am so enamored of your weaving. What’s up with the buttock? That’s no fun.